~More than 90 powerful devotions based on the life-changing moments in the lives of 30 Bible characters. The Bible contains many stories of people who experienced new beginnings, like Noah, Joseph, Moses, Ruth and Naomi, Queen Esther, the Good Samaritan, and Mary and Martha. 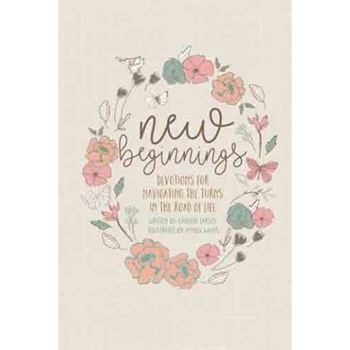 In New Beginnings, Carolyn Larsen focuses on 30 of these Bible stories and written more than 90 powerful devotions about each of these new beginnings. Scripture references have been included with each story to encourage further reading. Beautifully designed full-page Scripture verses and full-color whimsical artwork by Amylee Weeks makes this devotional perfect for gift-giving.